Bats are great mammals to have around, as they hunt mosquitoes and other insects at dusk, just when insects’ presence are at their climax. However, bats become unwelcome guests when they find a nice comfortable home in your home or business, entering through construction gaps, unsecured louver vents, chimneys, or any hole larger than 3/8 inches. If your home or business is occupied by bats, you may witness bats going in and out, or bat droppings (guano) underneath the bats’ main entrance(s). Homes and buildings are great places for bats to use as hibernating sites and as maternal roosts (a place to raise their young before they are able to fly). The adult females in a bat colony have not born pups just yet, but we are nearing that time. April is the perfect time to exclude bats from your home, before pups are born. After young are born, TSWM can continue preliminary exclusion work; however, the full exclusion process must be out on hold until all juveniles are able to fly. Northern Kentucky Bat Control: Since warm weather is here to stay, Tri-State Wildlife Management (TSWM) is currently conducting bat inspections and bat exclusions on houses, multi-unit buildings, and businesses. Now is the perfect time to take care of any bat problem you may have before female bats begin having young. The same principles apply to condos and apartment complexes, schools, churches, hospitals and more. All at-risk/vulnerable areas should be sealed so that bats do not find another way into the structure once excluded from using their main entry points. Although TSWM always strongly advises going about bat exclusion in this way, the decision is ultimately up to the customer. Unfortunately, if other potential entries are not sealed, bats almost always find their way back in. It is much more cost effective to seal up the home before bats can reenter. TSWM also offers full and partial attic cleanups. TSWM employees are trained in safe and effective methods of removing bat guano and contaminated insulation. In addition to the foul smell and unsanitary conditions, accumulated bat droppings can support the growth of histoplasmosis, an airborne fungal disease very common in the Cincinnati tri-state area. Due to the risk of exposure to diseases such as histoplasmosis, proper protective gear and equipment is vital to a safe and effective cleanup. For more information concerning bat exposure visit, the Center for Disease Control Website at: www.cdc.gov. TSWM is dedicated to resolving our customers’ bat problems and preventing bat issues in the future. Tri-State Wildlife Management is fully licensed and insured, and we stand behind all our work. For an experienced and professional bat removal company in Northern Kentucky, call Tri-State Wildlife Management at (859) 635-0037. Do you have bats in your attic? For bat removal and exclusion services, give Tri-State Wildlife Management a call at (859) 635-0037. Put our experience and expertise to work for you! Bat Control Newport, KY: Tri-State Wildlife Management offers bat removal, exclusion, and repair services to ensure that bats are gone for good. 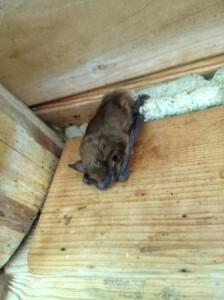 TSWM also offers full attic cleanups after bats are removed and excluded. Having bats in your home is an unsettling and serious problem, even if they are confined to the attic. Not only do they urinate and defecate anywhere they roost, causing staining and odor problems which are difficult to remove, they are associated with diseases which are dangerous to humans, including rabies and histoplasmosis (a lung disease caused by the spores of fungus which grow on their droppings or guano). Tri-State Wildlife Management will take care of your bat problem and make life normal again for you and your family. Tri-State Wildlife Management is a proud member of the National Wildlife Control Operators Association, and is certified Bat Standard Compliant by NWCOA. 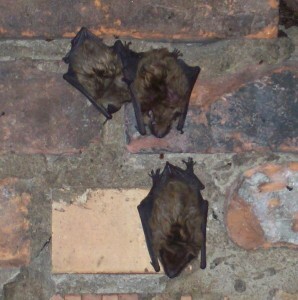 Posted in Bats | Comments Off on Do you have bats in your attic?